Add the perfect companion to your USB-C laptop and turn it into a complete workstation. Weather you are on-the-go or docking at a workstation, this ultra-slim docking station works as hard as you do. With it's stylish design, it will seamlessly fit into your setup. Now you can easily add a full-sized keyboard and mouse, external hard drives, printers, webcams by connecting only one cable to your setup. Connect up to 8 devices effortlessly to your laptop with a single USB-C cable. This docking station is equipped with memory card readers for SD/MMC/MicroSD memory cards for quick access to your data. 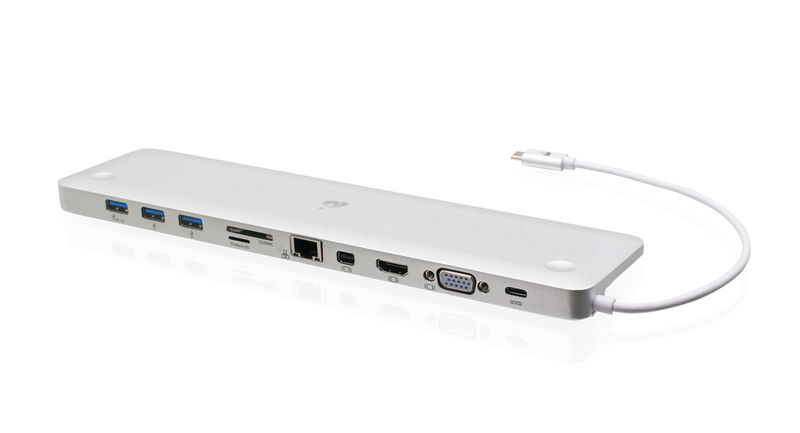 With three USB 3.0 (Type-A) ports, you can connect an array of USB Type-A peripherals. 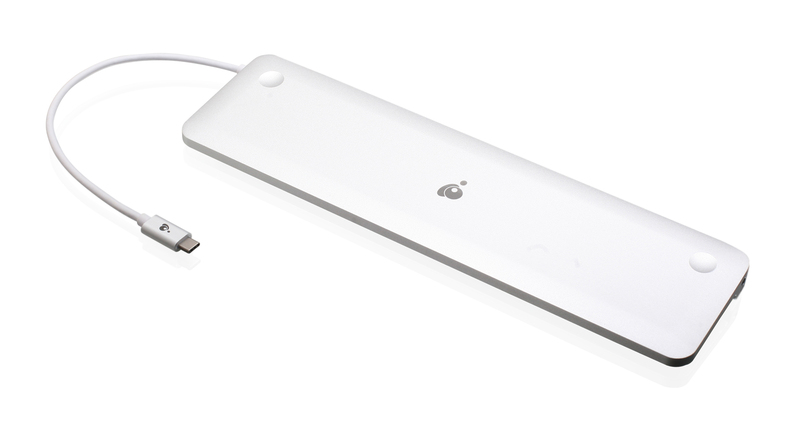 With the quick charge USB port, you can charge your phone or tablet at super-fast rates. 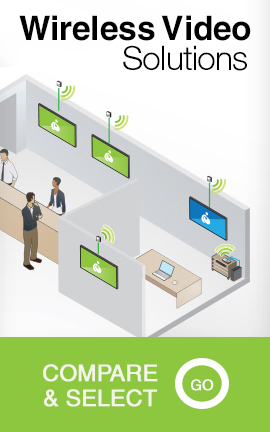 With the included Gigabit Ethernet power, you can connect to your LAN for robust data bandwidth and increased security. On top of all this connectivity, this docking station also offers the flexibility of 3 video connectivity options: HDMI, Mini DisplayPort or VGA. You can also connect a headset or microphone to complete your multimedia workstation setup. 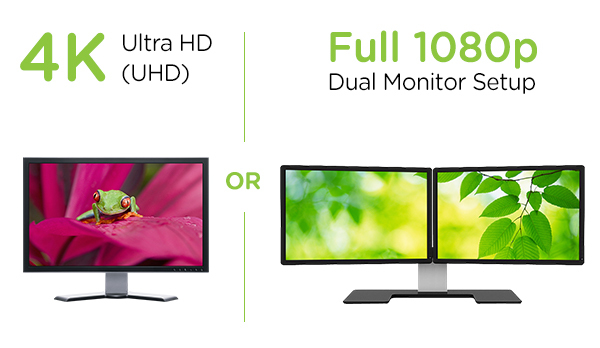 Adding two monitors to your laptop will improve your productivity and allow you to get more done. 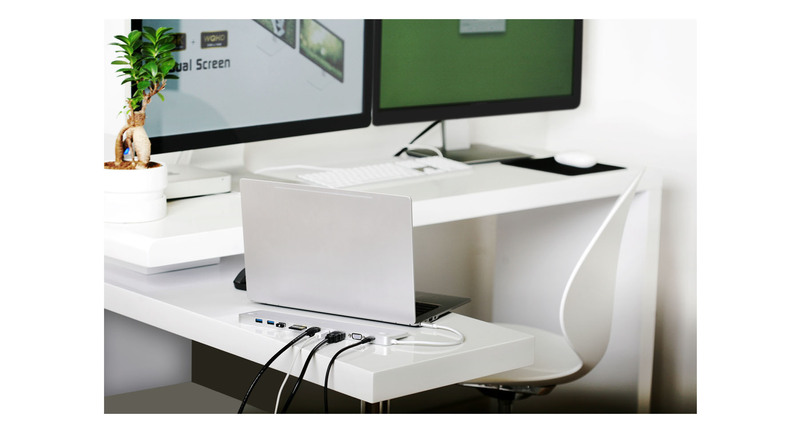 Mirror or extend your Windows USB-C laptop to two monitors or extend your MacBook or USB-C Apple laptop to one additional monitor. Browse the web on one screen, edit a document on a second. When using a Windows USB-C laptop, write an email or connect to a webinar on a third monitor. 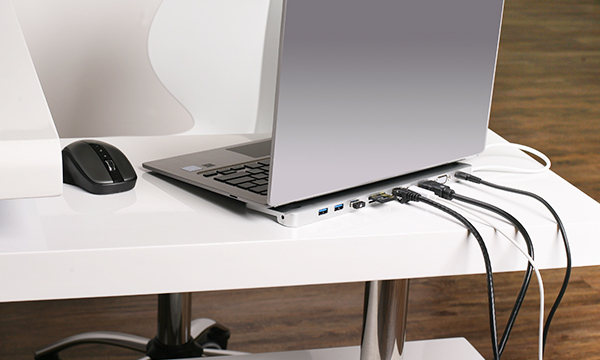 Charge your laptop while connected to your docking station without the need to buy an additional power supply. Connect your manufacturer's USB-C AC power adapter directly to the docking station and power your laptop while you work or play. With up to 60W of power delivery pass through, you can keep all your power-hungry devices and peripherals ready to go. When you are on-the-go, this bus-powered docking station does not need a power supply to connect your devices. This versatile and innovative dock design fits seamlessly into any workstation or setup. The intelligently contoured design provides the best ergonomic typing experience for your laptop. Save space on your desk by placing your laptop directly on top of the docking station or display the dock next to your monitors for a sleek, minimalist workstation. 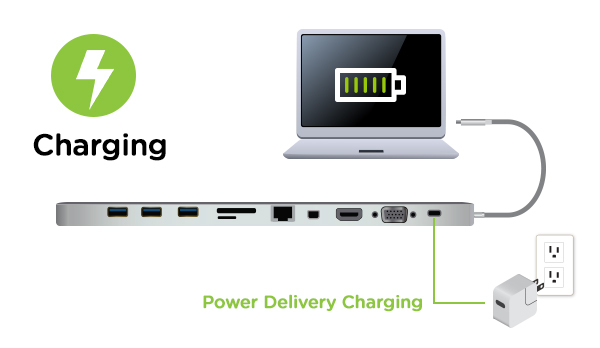 * Power Delivery pass-through requires USB-C charger from your laptop. A total of up to 60W can be charged to the laptop after deduction of 15W is used by the dock. ** Pass-thru power delivered to the laptop is dependent upon the capacity of your USB-C power supply. Ex. If your USB-C power supply is 60W, then the maximum power can be delivered to the laptop is 60W-15W = 45W. If your power supply is 87W, then the maximum power can be delivered to the laptop is 60W.